Chinhoyi, known until 1982 as Sinoia, is a town in Zimbabwe. It is located on the western banks of the Manyame River, in Makonde District, in Mashonaland West Province in central northern Zimbabwe. Its location lies approximately 121 kilometres (75 mi), by road, northwest of Harare, the capital of Zimbabwe and the largest city in that country. The town lies on the main road, Highway A-1, between Harare and Chirundu, at the International border with Zambia, about 250 kilometres (160 mi), further northwest of Chinhoyi. The coordinates of the town are: 17° 21' 0.00"S, 30° 12' 0.00"E (Latitude:-17.3500; Longitude:30.2000). The town sits at an elevation of 3,799 feet (1,158 m), above sea level. There are a number of small towns which are close to Chinhoyi. Banket lies about 25 kilometres (16 mi), southeast of Chinhoyi on the road to Harare, Alaska lies approximately 15 kilometres (9.3 mi) directly west of town, and Lion's Den, which lies about 25 kilometres (16 mi), northwest of Chinhoyi, on the road to Chirundu. Chinhoyi is the provincial capital of Mashonaland West Province, one of the ten administrative provinces in Zimbabwe. 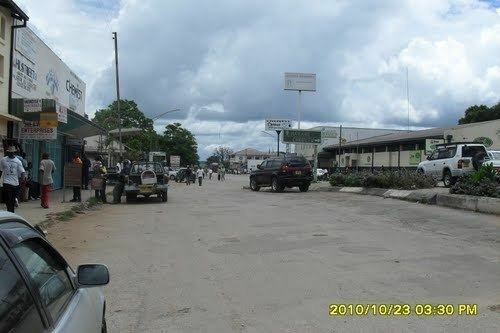 The town is also the district headquarters of Makonde District, one of the six districts in the province. The town is a college town, hosting two of the country's major universities, namely: Chinhoyi University of Technology (CUT) and Zimbabwe Open University (ZOU). The principal secondary schools in Chinhoyi include the three government high schools; Chinhoyi High School, Chemagamba High School aka Chinhoyi no 2 and Nemakonde High School, together with the private high school Lomagundi College. Chinhoyi houses Chinhoyi Provincial Hospital, the largest and most modern referral hospital in Mashonaland West Province. Some of the hotels in town include Chinhoyi Hotel in the center of town, the Orange Grove Motel, about 1 kilometre (0.62 mi), northwest of town on the road to Karoi and the Caves Motel, located about 8 kilometres (5.0 mi) northwest of town, next to the Chinhoyi caves. Tourist attractions in Chinhoyi include the Chinhoyi Caves in Chinhoyi Caves National Park. The limestone caves were first described by Frederick Courtney Selous in 1888. Chinhoyi was called Sinoia during the colonial era. It derives its name from Tjinoyi, a Lozwi/Rozwi Chief who is believed to have been a son of Lukuluba [corrupted to Mukuruva by the Zezuru] who was the third son of Emperor Netjasike. The Kalanga[Lozwi/Rozwi name] was changed to Sinoia by the white settlers and later Chinhoyi by the Zezuru. Sinoia was established in 1906 as a group settlement scheme by a wealthy Italian called Lieutenant Margherito Guidotti who encouraged ten Italian families to settle here.The Second Chimurenga War (War of Liberation) started in this town in the area occupied by the Chinhoyi Provincial hospital. Transport to and from Chinhoyi is mainly by road. Bus services connect Chinhoyi with Harare, Karoi, Kariba, Mhangura, Bulawayo, and smaller villages in the district. There is a small airport for private planes, called Chinhoyi Airport, located about 10 kilometres (6.2 mi), south of the central business district. The airport is said to be in need of maintenance. Chinhoyi is on a rail branch from Harare, which ends at Lions Den. There are scheduled passenger trains. Taxis operate within the town area. There is also a local bus service. Barclays Bank Zimbabwe, a commercial bank, maintains a branch in the town. ZB Bank Limited, sometimes referred to as Zimbank, another commercial bank, also has a branch in Chinhoyi. Standard Chartered Zimbabwe has a branch here as well. CBZ Limited is also another bank in Chinhoyi. The population of Chinhoyi during the 2002 census was 56,794. In 2004, the town's population was estimated at 61,739 people. The next national population census in Zimbabwe is scheduled from 18 August 2012 through 28 August 2012.